I came across this interesting interview with Hilary Mwelwa of Hill St. Soul fame on Essence.com. In the piece she speaks quite candidly about the obstacles she encounters as a Black British female soul singer in the UK. Read below for full interview. The legacy of Black American singers dashing to Europe for artistic refuge and acceptance extends to Josephine Baker, Nina Simone and Tina Turner. However, it rarely seems to work in reverse: Black British singers crossing over to the States rarely receive the same warm welcome or recognition of their brand of soul. Hilary Mwelwa and her partner, Victor Redwood Sawyerr, of the R&B duo Hil St. Soul are hoping to change that. Their 2006 album, “SOULidified,” impacted the American charts, racking up two Top 20 Urban AC hits with "Goodbye" and "Hey Boy." Now, they’re back with "Black Rose," an intoxicating, eclectic mix of traditional Zambian music, pop, and soul, featuring the funky “Don’t Forget the Ghetto,” the emotional “We Were In Love” and the redemptive "Smile." 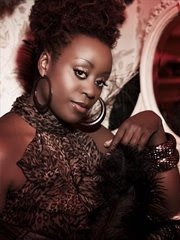 Mwelwa makes time for ESSENCE.COM to speak about the new album, the plight of the United Kingdom's Black soulstresses, and why she will never conform. ESSENCE.COM: How does your new album "Black Rose" differ from your first two albums? HILARY MWELWA: I think there is a natural progression. Primarily, I feel like the subject matters I’ve touched upon with this project are a lot more diverse. I’ve evolved as a singer and songwriter and my vocals have definitely improved because of years of singing. ESSENCE.COM: Did you have the U.S. market in mind when making "Black Rose"? MWELWA: Not necessarily. Whatever project I'm working on, I first try to create music that is truthful to me and keep with the Hil St. Soul vibe. Foremost, it is really about the integrity of the songs and myself as an artist. ESSENCE.COM: The title track addresses women feeling comfortable and happy in their own skin. Do you ever feel pressure to conform? MWELWA: I don’t. For me, what is more important is the material that I sing and the messages that I’m putting out there as opposed to what I look like. Different strokes for different folks—some people like to wear next to nothing—and I don’t have a problem with that. Personally, I believe it’s important to celebrate all shapes, sizes and colors. You guys have Jill Scott, an amazing artist and not your typical artist in terms of image, but it doesn’t mean that she is any less talented. I don’t think she has to be Ashanti and, for me, Jill Scott’s songs are more engaging. At the same time, Ashanti appeals to a different audience. I think there is room for everybody. So I don’t feel pressure at all to try and fit in. Variety is the spice of life; it would all be very boring if we all looked like Ashanti or whomever out there. ESSENCE.COM: Does the resurgence of White female soul singers in England, such as Amy Winehouse and Adele, have a positive or negative effect on a Black female soul artist from the U.K.? MWELWA: I think it has a negative effect. At the end of the day, if you’re talented at what you do then you’re entitled to have that kind of stage or shine, but what I’m noticing is that people like the Amy Winehouses and the Adeles get a bigger push from labels. There are not that many Black female artists actually getting signed in the U.K. It really is about the Adeles, Duffys and Amys. It does have a negative impact, and you question it. A Black female artist singing soul music versus a White artist singing soul or whatever you want to call it, we don’t seem to get the same kind of love that they do. Not to say that I don’t feel Amy Winehouse deserves to have that spotlight on her, but everybody should get the same opportunity and I don’t think [the U.K.’s Black female] artists do. ESSENCE.COM: How different do you think your career would be if you were an American R&B artist? MWELWA: (Laughs) I wouldn’t say that my career would necessarily be different as an American artist. I think if I had a bigger budget, had a machine behind me, I would be in a different position. It’s really difficult to say because good music is good music regardless of where it is from. I actually get more love from you guys than I do over here, which speaks volumes in itself. I think if I spent more time in the U.S. I’d be able reach a wider audience, that’s the only thing I can think of that would further my career. ESSENCE.COM: Is there a musical formula that a British artist needs to adopt to appeal to American audiences? MWELWA: I’m not sure. At the end of the day, music is a universal thing. Whether you are American or British, we all go through the same life experiences and it’s really about how you are able to convey that in your songs. I don’t necessarily think there is a specific formula, but I guess in general you try and stand out. You have to be a different flavor and that is the only formula you can ever really rely on. ESSENCE.COM: Many songs on the new album, such as “Broken Again,” are about the trials of relationships. Are you currently in a relationship now? MWELWA: Actually, I’m not. That song is about falling into the same trap as you did before, falling for that same person again. ESSENCE.COM: A friend of mine is going through a breakup now and she told me, “I can’t be happy alone.” What would be your advice to someone who feels that way? MWELWA: When you’re in that headspace, you do feel like you can’t get over that person because you are unhappy. But try and hold out; there is always light at the end of the tunnel. I believe that if someone doesn’t love you unconditionally, you’ll never be happy. A friend of mine says, “You were who you were before you met that person. That person doesn’t make you who you are.” You really have to try and take things like that on board. “Black Rose” (Shanachie) is in stores now. For more information, visit MySpace.com/hilstsoul.